Chanteuse US née Teresa Breuer, le 7 Mai 1931 à Toledo (Ohio). 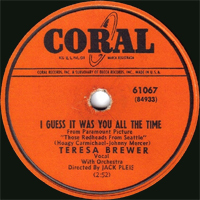 Teresa Brewer a débuté en 1949 chez London Records. En Octobre 1972, elle a épousé Bob Thiele, un des directeurs de Coral Records. Elle est décédée le 17 Octobre 2007 à New Rochelle (New York). 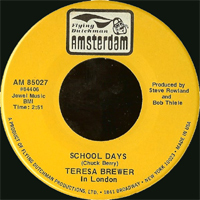 Teresa Brewer started out as a spunky novelty Vocalsist in the 1950s and weathered the rise of rock to emerge as an exuberant jazz singer in the 1970s. Though some find it disconcerting to hear her cutesy, slightly nasal Your Hit Parade-style delivery in a jazz context, at her best she can swing with a loose and easy fervor, aided greatly by the distinguished company she often keeps on her records. 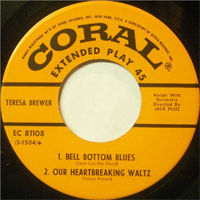 Brewer started singing on Major Bowes' Amateur Hour at the age of five and scored her first big hit as a teenager in 1950 with the diabolically catchy "Music! Music! Music!" That ditty found its way onto almost every jukebox in the land and launched a series of hit singles on Coral stretching all the way to 1961. Her marriage to record producer Bob Thiele in 1972 led to her re-emergence via a long string of albums for Thiele's labels (Doctor Jazz, Signature, Red Baron), often in tandem with such luminaries as Count Basie, Benny Carter, Duke and Mercer Ellington, Stephane Grappelli, Earl Hines, and Clark Terry. 1949 78 t. LONDON 562 (US) . 1950 78 t. LONDON 563 (US) . Ol' Man Mose / I Beeped When I Shoulda Bopped! 1951 78 t. LONDON 878 (US) . 1952 78 t. CORAL 60829 (US) . 1955 78 t. CORAL 61362 (US) . Pleging My Love / How Important Can It Be? 1955 SP CORAL 9-61362 (US) . Pleging My Love / How Important Can It Be? 1968 SP SSS INTERNATIONAL 735 (US) . 1968 SP SSS INTERNATIONAL 744 (US) . 1974 SP SIGNATURE 10 100 (US) . 1975 SP SIGNATURE 10 173 (US) . 1976 SP SIGNATURE 10 609 (US) . 1976 SP 33 t. SIGNATURE DLJI-1670 (US) . 1977 SP IMAGE IM-3061 (US) . 1979 SP SIGNATURE 102 (US) . 1983 SP SIGNATURE 04114 (US) . 1984 SP SIGNATURE 04654 (US) . 1986 SP COLLECTABLES 4226 (US) . Music! Music! Music! 1961 LP 12" CORAL CRL-57361(US) SONGS EVERYBODY KNOWS - Walking The Floor Over You / Have You Ever Been Lonely (Have You Ever Been Blue) / Mockin' Bird Hill / Mexicali Rose / Anymore / My Happiness / Jealous Heart / Half As Much / When Do You Love Me / Your Cheatin' Heart / San Antonio Rose / Jambalaya (On The Bayou). 1964 LP 12" PHILIPS PHS-147 (US) GOLDEN HITS OF 1964 - Where Did Our Love Go / World Without Love / Chapel Of Love / Love Me With All Your Heart / My Guy / Suspicion / Hello Dolly (Hello Louis) / Everybody Loves Somebody / My Boy Lollipop / Gotta Get Along Without You Now / Girl From Ipanema / Dern Ya (Dang Me). 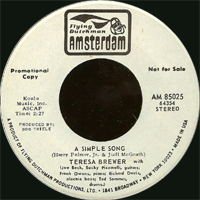 1968 LP 12" CORAL VL-73847 (US) HERE'S TERESA BREWER - Just In Time / Lover Come Back To Me / Day By Day / Honeymoon / Last Night On The Back Porch (I Loved Him Best Of All) / They Can't Take That Away From Me / One Rose / Penthouse Serenade / When I Lost You / Ma (He's Making Eyes At Me). 1985 LP 12" DOCTOR JAZZ FW-40232 (US) THE MIDNIGHT CAFE - Ac-Cent-Tchu-Ate The Positive / I Dream Of You / Come On And Drive Me Crazy / Am I Blue / My Ship / Flat Foot Floogie / Dream A Little Dream Of Me / Life Is Just A Bowl Of Cherries / Jeepers Creepers / Hold Me / What Are We Gonna Do?